Sit back, make yourself comfortable. Grab yourself a nice drink. Whiskey, maybe? 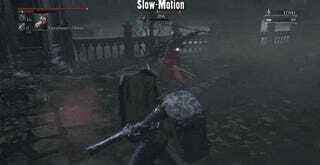 And then enjoy five minutes of some of the best that Bloodborne PvP has to offer. Corps Peau Rate brings us a duel where two Bloodborne players go all out in terms of weapons, tactics, moves, and intensity. It’s probably the best Bloodborne fight I’ve seen yet—both players are highly skilled, and it’s a joy to watch them dance. Best of all, both of the players are utter gentlemen about their fight to the death. Good show, fellas.